Riding a bike to work: a pipe dream just one short month ago, a reality this morning. Mainly because my car’s exhaust is trying to fall off. We made virtue out of necessity, Felix and I: I timed the cycle to work yesterday and today- Monday – our cycle was for real. I have loved the first ten days of bike ownership. A pale blue basket-bike for English ladies is just the thing to nip to the shops, or ensure your cabin-feverish son gets some exercise. And today was to be the acid test. For how much petrol would I save , if I cycled instead of driving round the roads to get to the Victorian mansion where I work? But it is not a thing to be late on. Yet somehow, though I knew how vital it was to start out in good time, we left unfashionably late. The people I work with would not have worried, but I hate being late with a passion. We pedalled furiously to my sister’s house just behind Felix’s school, and I dropped a very happy Felix off. He loves cycling. I was going for the non-picturesque route today. I could cycle through the forest, but it is complicated. I pass a huge park and the crematorium and the golf course and an estate of roomy detached houses before skirting the white stables which are the only original part of the old hunting lodge used by most of the English kings and queens. But today I was looking for the no-frills route. Under the underpass and through the grounds of the local secondary school, downhill all the way. I couldn’t panic because I was pedalling like the clappers: a strange eccentric lady in pinstripes on a pale blue sit up and beg bicycle, the picture completed by an incongruous cycle helmet of little charm and worse fit. I think it is one of Phil’s. The wind was whistling past my ears and my beautiful bike was whirring compliantly up and down its gears like a graceful dowager. And it dawned on me that, not only was I not going to be late, but that my bicycle was going to get me there a couple of minutes early. I screeched up to the bike stands, doing a creditable impression of a bellows. I took off my hat and retrieved all my files from the panniers and locked up my bike, and headed for the mansion. But the trip to work was not over yet. For there are many stairs in this great house. I charged in through the front door and ran up the stairs two at a time until, at the middle landing opposite the divine stained glass window, my brain caught up with what I was doing. Are you insane? it upbraided me. You have cycled to work. Fast. And now you’re charging upstairs like some crazed giraffe? I checked my inner giraffe. Om, I told it. There is an old-English name for bellows. They are called a blast-bag, or more commonly a blowing bag. That term perfectly describes me as I got to the top of the huge oak staircase, with another merciless flight of stairs still to go. I made it, but I couldn’t say good morning when I got to the top. I just grinned, wheezed, and headed straight for the teapot. 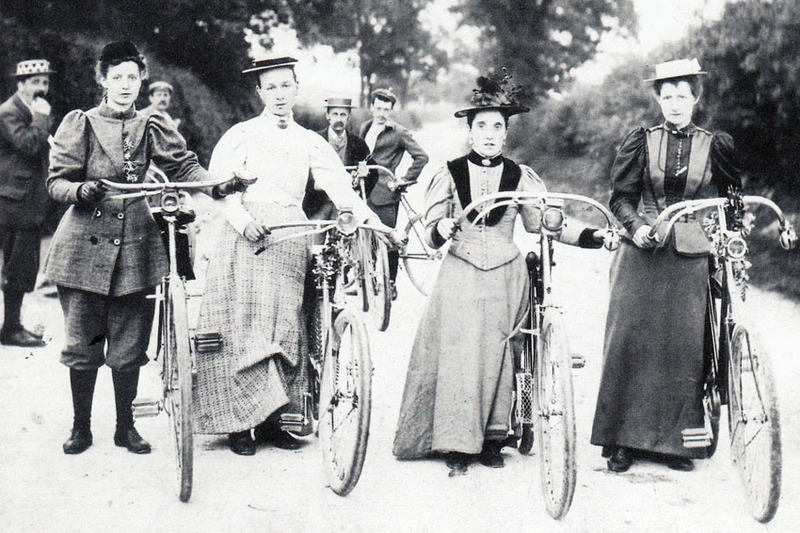 Posted in Shrewsday MansionsTagged bicycles, bike to work, ladies in suitsBookmark the permalink. At least you weren’t riding a boneshaker :-). 😀 That’s the silver lining to my silver lining, Steven. wow, getting fit as well! what a bonus.no more feeling guilty at not going to the gym. I cannot keep up gym memberships, Sidey. Expensive and not habit-forming enough for me. But anything outdoors is just great, and free as well..
do you have a ‘scenic’ option, where you can watch the summer progress of gardens etc? Here’s hoping the next time you ride your bike to work it will be a pleasant, leisurely trip. Alas, the next day was similar brinkmanship, PT; but I enjoy the journey just the same. And the pounds are just melting away. I love this charging about bike – it’s making us all smile! It’s a great little machine, Wanderlust! I used to favour bikes on strictly downhill-only terms, IE. And then I’d walk up the hills pushing it. I’d love to be able to ride a bike to my work. But I’m at lake level and it’s a good hour or so of that terrible gradual incline of ‘not quite a hill, but feel the burn in your legs’, and the area around my work is one of those horribly unpleasant heavy traffic areas where even being a pedestrian is frightening, and they get a sidewalk. I hope it works out well for you – you’ll soon have some pretty impressive leg strength, I’m sure! Hi Lexy! I’m looking forward to the day I begin to get strong. I am not a natural at this stuff. Tandy, you are right. The descent is a total pleasure. I must film it one day for you all to see! Yay, Kate! Biking to work is sure to benefit your inner giraffe ~ in all manner of ways! I’ll be quite the co-ordinated giraffe, won’t I, Nancy? Relaxed and leisurely on the way home, or uphill? Some uphill. But I still got there in ten minutes. I felt smug beyond words at the school gate, though I must have looked odd. Vey fun post Kate. “Om, I told it.” I may have to still that line. It works especially well on inner giraffes, Tammy. Love this post, Kate. I can just see you, whizzing through the lanes. If I remember correctly, didn’t Phil first notice you when you were flying to work on your bike? Alas, that was a car, Andra – I arrived at a traffic jam and cheated by taking the empty fast lane, straight past Phil. Very bad manners. If I had had a bike I could have done it with a clean conscience. Ah, but just think of the great things you did for your body. You will be fit and strong and help save the environment in the process! I am channeling smug, Carrie. Insufferable. Oh but you’re going to be in such great shape!! You must get yourself a perfectly matched “hat” and keep this up! For some reason, though, I have you dressed like the women in your photo. I’ve created an entire character in my mind to match your story…somehow I’ve made you Mary Poppins! LOL! Lovely story, and so resourceful! Matching hat, Debra. Got it. And long skirt 😀 They do look glorious, don’t they? Fraid you would have been guffawing away, Tom. I have never been very good at getting ‘the look’, and cannot for the life of me emulate the dress of the cycling fraternity. Let us hope so, MM, let us hope so! Nope: I was haring off to catch the end of schol and pick up Felix! No rest for the wicked! I am revved a large proportion of the time, bdh…. Why a giraffe? I heard a giraffe joke only yesterday – Why is the giraffe’s neck so long? … Because his head is way up high…Maybe Felix will like it. 😀 lovely, Elspeth. Sometimes, when you are grasping at a style of movement, an animal is the best recourse, Usually I am rather like a camel. Today, ganglier than usual. Yes: he has always loved the bike. And now Maddie is talking about wanting one too. It’s all good stuff, Jan! Fantastic! We need a picture of your bicycle. Well, preferably a picture of you on the bicycle, but a picture of just the bike may have to do. And you need to come to Charleston and go riding with the Accidental Cootchie Mama. I can just see you two on a nice bike tour of the city. What a brave soul you are, charging up all those stairs. I, of course, would have first fallen off of the new cycle, or ran into a tree, or some such catastrophe. Launching up the stairs at full throttle would have had me gasping for one last breath. I do love to hear how much you are enjoying your new set of wheels., Kate. I feel winded just having read this post, Kate. Doesn’t Clive Bond like to nestle on handlebars or am I imagining he has that habit? I think the bicycle is one of the most magnificent inventions of all time, in the way that it converts human effort into so much greater efficiency! Riding at a more leisurely rate is, however, more fun! Cheers to you for your excellent ride and timing. How far is it to work? Anyone knows that a bit of om and tea works wonders on a crazed giraffe. 😀 Hilarious, Kate.